One of our most popular self-laminating wrap around labels. Primarily used in network cabling, patch panels, and other data communication applications. Our Labels are high quality, durable and resistant to smudges and scratches. Our quality films create a superior product label and cable label that can be used in many applications indoors and out. The smallest self-laminating label we offer. Great for light gauge wire, multi-cable harnesses, and speaker wiring. Ideal for multi-purpose labeling projects that can benefit from self-laminating labels. They are manufactured using a clear polyester film with an ink receptive print area. The film is coated with a permanent, UV-resistant, pressure-sensitive adhesive. Our labels are backed with a two-sided, poly coated, printable, lay flat release liner. The film is approved for indoor/outdoor use with occasional exposure to oil and water. Suitable for all standard office laser printers. Please note: Each LSL 70 sheet contains 156 Labels. 10 sheets you will net 1560 labels, 20 sheets = 3120, etc. 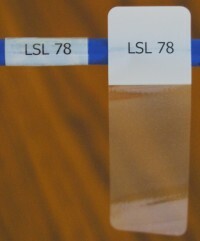 Laser printable Cable Labels are ideal for multi-purpose labeling projects that can benefit from self-laminating labels. They are manufactured using a clear polyester film with an ink receptive print area. The film is coated with a permanent, UV-resistant, pressure-sensitive adhesive. Our labels are backed with a two-sided, poly coated, printable, lay flat release liner. The film is approved for indoor/outdoor use with occasional exposure to oil and water. W 0.50 in x H 1.50 in x Print H 0.50 in x Wire Dia (low) 0.16 in x Wire Dia (High) 0.32 in x Wire Gauge 0.16 in. - 0.32 in. Please note: Each LSL 71 sheet contains 78 Labels. 10 sheets you will net 780 labels, 20 sheets = 1560, etc. Perfect application for small gauge wires that require long descriptions or barcodes. Please note: Each LSL 75 sheet contains 84 Labels. 10 sheets you will net 840 labels, 20 sheets = 1680, etc. Our Laser printable Cable Labels are ideal for multi-purpose labeling projects that can benefit from self-laminating labels. Ideal for Cat 5/6/7 and 10G - W 1.00 in x H 1.33 in x Print H 0.50 in x Wire Dia (low) 0.16 in x Wire Dia (High) 0.26 in x Wire Gauge 0.16 in. - 0.26 in. Please note: Each LSL 77 sheet contains 49 Labels. 10 sheets you will net 490 labels, 20 sheets = 980, etc. Durable label design for Power Cable Applications such as the SOW 18, SOW 16, SOW 14 as well as VGA and other Audio/Video Cables. Please note: Each LSL 78 sheet contains 21 Labels. 10 sheets you will net 210 labels, 20 sheets = 420, etc. Cat 5, Cat 6, USB, Thin VGA, CCTV Applications, RJ6, RJ11 Ideal for Cat 5/6/7 and 10G, medical and lab vial labeling. W 1.50 in x H 2.00 in x Print H 0.75 in x Wire Dia (low) 0.24 in x Wire Dia (High) 0.40 in x Wire Gauge 0.24 in. - 0.40 in. Please note: Each LSL 79 sheet contains 16 Labels. 10 sheets you will net 160 labels, 20 sheets = 320, etc. W 1.88 in x H 3.17 in x Print H 0.97 in x Wire Dia (low) 0.31 in x Wire Dia (High) 0.69 in x Wire Gauge 0.31 in. - 0.69 in. Please note: Each LSL 80 sheet contains 12 Labels. 10 sheets you will net 120 labels, 20 sheets = 240, etc. W 0.80 in x H 1.44 in x Print H 0.50 in x Wire Dia (low) 0.16 in x Wire Dia (High) 0.32 in x Wire Gauge 0.16 in. - 0.32 in. Please note: Each LSL 81 sheet contains 54 Labels. 10 sheets you will net 540 labels, 20 sheets = 1080, etc. 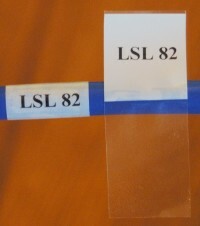 Please note: Each LSL 82 sheet contains 36 Labels. 10 sheets you will net 360 labels, 20 sheets = 720, etc. Please note: Each LSL 83 sheet contains 18 Labels. 10 sheets you will get 180 labels, 20 sheets = 360, etc. H 1.50 in x W 2.00 in x Print H 0.50 in x Wire Dia (low) 0.24 in x Wire Dia (High) 0.40 in x Wire Gauge 0.24 in. - 0.40 in. Please note: Each LSL 84 sheet contains 24 Labels. 10 sheets you will net 240 labels, 20 sheets = 480, etc. An extra long self-laminating wrap around label. Sheet size is actually 8.5" x 12" to fit the labels. Primarily used in network cabling, large cables, and other data communication applications. 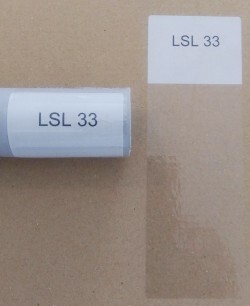 Please note: Each LSL 33 sheet contains 8 Labels. 10 sheets you will net 80 labels, 20 sheets = 160, etc. This product is used by many industry professionals who need durable, long lasting, permanent sheet labels with the added protection of a self-laminating, polyester wrap. Cable labels are perfect for networking and telecom installations as well as medical and lab applications. Our film is specially designed for use with small cables such as fiber optics and thin VGA cables.